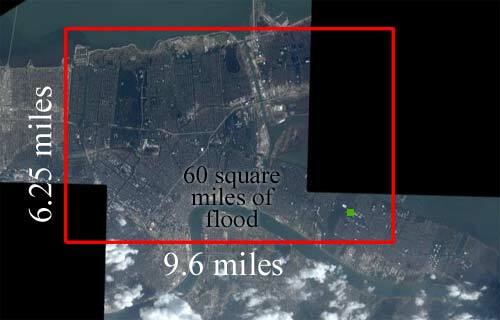 Google Maps has satellite maps of the levee-break damage in Louisiana. 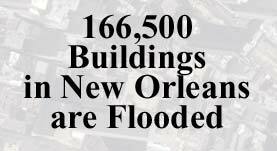 The floodwaters seem to be covering about 60 square miles of New Orleans. Note the green square in the lower right corner. When I zoomed in on this green square, representing a few blocks between E.St. Avide Street and Girod St., and Laplace St. and Paris Rd., I could easily count the individual buildings. There are 111 buildings here, marked with red dots. 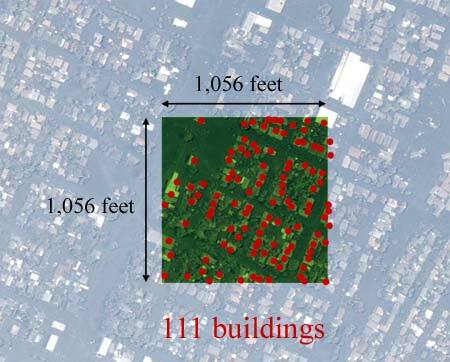 If this distribution of 111 buildings per twenty-fifth square mile is a good sample, 60 square miles will contain approximately 166,500 flooded buildings. I hope I'm doing this math wrong.